Ben Hilfenhaus has suffered a hip injury that has forced him to end his time at Nottinghamshire and return home to Australia. The 32-year-old seamer joined Notts in early June as the replacement overseas player to Vernon Philander. Hilfenhaus played in three County Championship matches and four T20 Blast games for Notts. "The injury will rule him out for around six weeks," director of cricket Mick Newell told the club website. "It's obviously disappointing for Ben, who gave everything during his time with us, and disappointing for Notts because we wanted him to become a key player between now and the end of the season." 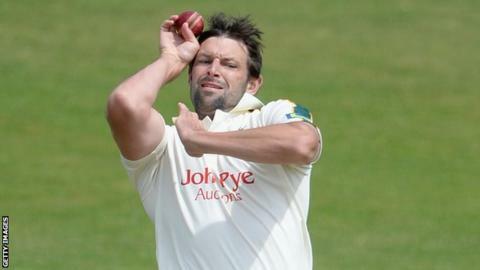 Hilfenhaus injured himself in the Division One game against Worcestershire, in which he took five wickets, after contributing 41 overs due to Notts having other bowlers injured. The Australian will now return home to recover and prepare for the season ahead with Tasmania.